With its predecessors having received critical acclaim, expectations for the next release in the Arkham series were always going to be high. 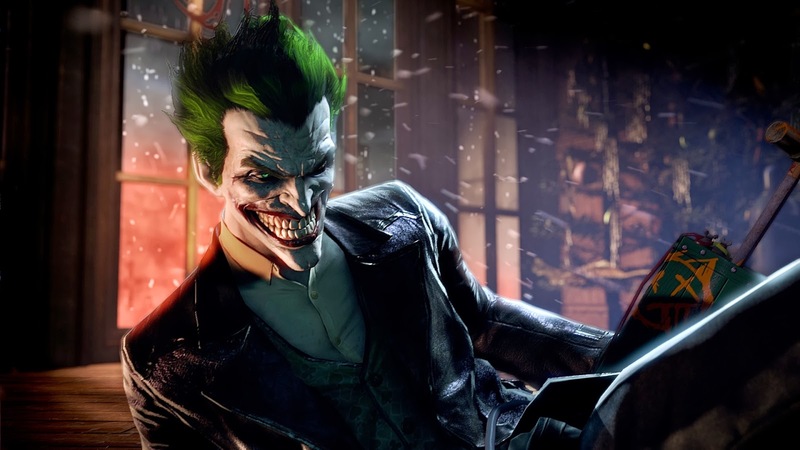 The change in developer from Rocksteady to Warner Bros. Games Montreal has been met with trepidation from gamers, unsure as to whether the new developer can continue on the run of great quality Arkham games. With an interesting plot along with new and returning villains, how will the dark knight fair as a wanted man on a cold, Christmas Eve night? 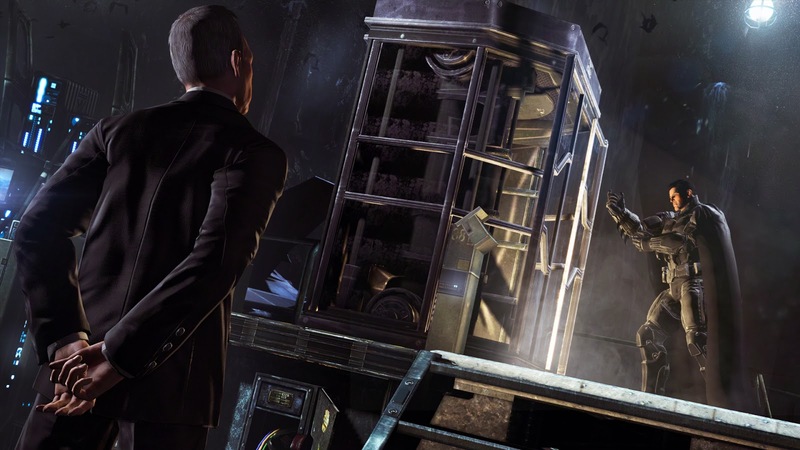 Set five years before the events of Batman: Arkham Asylum, Arkham Origins sees a bounty of $50,000,000 placed on the head of Batman by Black Mask. This bounty attracts 8 assassins to Gotham City on Christmas Eve, all with the goal of eliminating Batman before the nights end firmly in their sights. The assassins plot never fulfils its potential unfortunately with the use of some of the assassins coming off very weak. You won’t even meet all of the assassins if you only stick to the main objectives, which makes some villains feel very unimportant. However when you look past that, you’ll see that there’s a very solid coming of age story for Batman throughout the game as he learns to accept the help of others. His relationship with Alfred is well documented and feels real thanks to the increased amount of screen time given to Bruce’s trusty butler. Two other relationships that have to be mentioned are the start of Batman’s friendship with Jim Gordon and his explosive conflict with archenemy The Joker. This younger, more aggressive Batman is harder to get along with the character we are used to seeing, and it actually makes him somewhat unlikable during the first half of the game, enough to make you side with Gordon during their altercations. The new voice of Batman, Roger Craig Smith puts in a satisfying performance throughout, however it’s Troy Baker’s Joker that constantly shines, making almost every scene he is in a memorable one. The initial meeting between the two stands out as one of, if not the best moment in the entire game, with Baker’s performance being at the centre of it. Despite an odd decision here and there (such as the unrealistic idea of no one being out on Christmas Eve) and a final third that felt weak and somewhat rushed, the overall plot manages to do a good enough job focusing on the change within Batman, especially during the first half of the plot which is really enjoyable stuff. Hailed for its innovative and fast paced greatness, the freeflow combat has been left untouched for the most part outside of new animations, allowing it to remain as slick, smooth and brilliant as ever. You are now graded after each battle on how well you do; taking into account the damage you took and dished out, the gadgets used etc. While it can be nice seeing how well you have done in battle, it’s an unnecessary addition that’s better kept to the challenge maps. The new CSI-like detective breakdowns are really well done and interesting to watch play out, as you reconstruct what has happened using clues around the area you are in, which you can then rewind and fast forward to find even more in-depth clues. It’s a cool mechanic that could be built upon even more in future additions, possibly making it not as linear, so that you can use it to find all sorts of evidence without the game holding your hand throughout the procedure. New gadgets added to help keep the gameplay feeling fresh include shock gloves and the remote claw. The remote claw is a simple, yet real great addition to the series, allowing you to connect different points, items and even enemies together, making predator encounters even more amusing. While the shock gloves are unbelievably handy, they do feel almost like you’re cheating when you use them. They also fall into one of the obvious problems you could run into when doing a prequel and that’s introducing a weapon that’s more powerful than what was available in the games set afterwards, I mean why would Batman stop using these shock gloves when they are so ridiculously powerful? As expected, Gotham city is a larger map then Arkham City was, with the entirety of the AC map taking up around half of of the Origins map. Of the new areas that you can visit, the stand out is easily the GCPD which is a lot of fun to explore. Seeing Gordon talking to fellow officers while elsewhere in the building corrupt cops plan to take you out is a cool watch. Speaking of new areas, the Batcave can finally be explored allowing you to speak to Alfred, access training and challenges (without having to go to the main menu), change your bat suit and fast travel across Gotham. While you won’t spend a vast amount of time in the Batcave, the fact it’s there just makes the Batman experience that much better. Fast travel to each area in Gotham has to be unlocked, by shutting down towers set up by Enigma, who in vintage Riddler style has left you challenges to complete all over Gotham. Enigma isn’t the only villain you deal with outside of the main storyline, as Anarky, The Mad Hatter and a few other surprises turn up as ‘Most Wanted’ missions, adding a great amount of variety and playtime to the game. Unfortunately the gameplay does have a few hiccups. The placement of some objects can leave you confused as to why Batman can’t jump over them despite their short height, enemies may fall through surfaces or get stuck walking into walls, textures pop-in when entering a new area and there are a few moments where QTE’s have been used in a ridiculously unnecessary manner, breaking up a cutscene when the QTE could have easily just been a part of it. All of these problems stop Arkham Origins from feeling as polished as Asylum and City. Last but not least, challenge maps are back and as addictive as ever with almost 300 trophies available to try and get in ranked, campaign, custom and combat training challenges. There’s excellent variety and a lot to love for those that enjoyed challenge maps on the previous Arkham titles. The announcement of an online mode for Arkham Origins both intrigued and worried gamers. Would this be a weak add-on that would be left with empty servers a few weeks after the game’s release? Right off the bat I was surprised at the amount of options you are given to customise your criminal, with body types, head gear, face paint and tattoos all customisable (with more options available as your level increases). Sure it doesn’t offer as much customisation as some of the online games we are used to seeing each year, but it’s still good to have as it allows you to add a little personality to your characters which could have easily been left out. 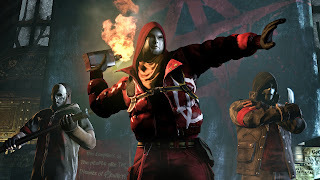 The online gameplay itself works as a more flushed out version of the usual predator encounters, with three of Joker’s criminals facing off against three of Bane’s while Batman and Robin stalk all six in an attempt to fill their intimidation meter for the win. As you could imagine, this type of mode is very chaotic. 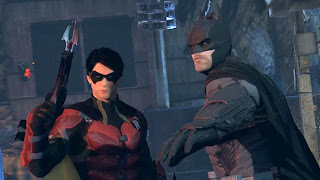 As Batman and Robin, you have many of the single player gadgets at your disposal and pouncing on unsuspecting convicts is really exciting, whereas when you are in the criminals’ shoes, knowing that Batman and Robin are watching your every move leaves you feeling genuinely fearful. It can be fun, however the bland gang on gang action leaves a lot to be desired, and it feels like a mess due to just how much is going on in such darkly lit maps. You’ll have your detective vision/goggles on for the majority of your time when playing online, as without them on you’ll find yourself getting killed a hell of a lot. Joker and Bane are both available to play as at some point during each game and both come with their own weapons, Joker with a handgun that has ricocheting bullets and Bane with a rocket launcher (like someone his size needs a freaking rocket launcher!). Overall the online turned out much more advanced then I was expecting it to be, with perhaps too many gadgets being used all over the place resulting in a rather messy experience. Playing as the heroes and super villains is where the main enjoyment can be found. Arkham Origins is certainly one of the best looking games this year, continuing on from where Arkham City left off. Character models look excellent, with facial animations looking particularly impressive. Gotham looks as dark and gritty as Arkham looked, which due to the aesthetic really helps to immerse the player. As mentioned above, Roger Craig Smith and Troy Baker do a great job as the lead voice actors leading to amazingly consistent cutscenes. While no other voice actors stand out, none do a particularly bad job. The music remains much the same as we are used to, with the soundtrack managing to hit a level between Batman: The Animated Series and Christopher Nolan’s trilogy. While a more noticeable change would have been nice, the soundtrack remains as solid as ever. Arkham Origins doesn’t hit the same level of quality as its predecessors, however it still offers a better superhero gaming experience than most games out there. Graphically its superb, gameplay wise it’s more than solid with combat that’s up there with the best and the plot, while disappointing, is a pleasant take on the caped crusader’s first encounters with some of the most important characters in the Batman universe.